Will you see the constellation Scorpius the Scorpion’s stinger stars below the waning crescent moon in the cold dawn tomorrow? You will need a clear, unobstructed view to the south to southeast to spot the stinger stars – Shaula and Lesath – flickering by the horizon. If you cannot spot these stars tomorrow, try again in later winter. 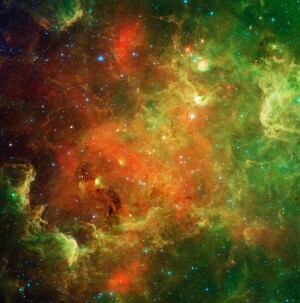 The stars at the end of the Scorpion’s tail are also known as the Cat’s Eyes. For the Pawnee, who roamed the prairie of Kansas and Nebraska, the sky was a calendar, and the stars foretold the change of seasons. It is believed that the Pawnee called the stars on the Scorpion’s stinger the Swimming Duck stars. These stars are now coming into view shortly before dawn. 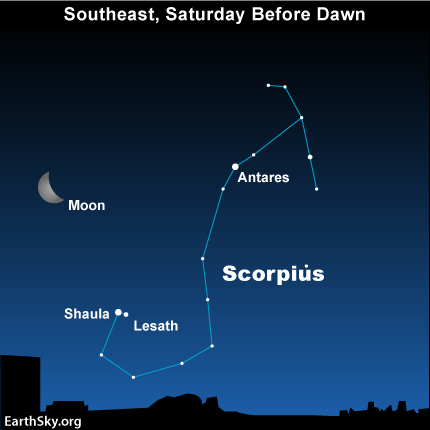 As we approach the end of winter, Shaula and Lesath will appear higher each morning in the dawn and predawn sky. Their morning appearance tells us that the prairie is about to awaken to the rolling thunders of spring. Site contents copyright © 2019 Recorder Online	except as noted. All rights reserved. | 83 queries in 1.120 seconds.